Most people snore at least once in their lifetime whether it is brought on by nasal congestion, a strange sleeping position, smoking, medications, or seasonal allergies. It’s a natural circumstance caused by the relaxed state of your mouth and throat muscles during sleep. However, if it’s chronic, it can disrupt your sleep causing irritability, fatigue, and brain fog. Statistics show that nearly 90 million Americans chronically suffer from a sleep disorder and wakefulness. Typically, men are portrayed as the snorer. This is a fact; more men tend to snore than women. Forty percent of adult men and twenty-four percent of adult women are snorers. This number increases with age. Fortunately, non-invasive, natural treatments and remedies for snoring exist. See your doctor to discuss underlying conditions and treatment options before trying any anti-snoring product or technique. A snore is a hoarse, harsh breathing sound that happens during sleep. When sleeping, the muscles in the throat relax, the tongue drops to the back of the throat and presses the soft tissues at the back of the throat. The airway becomes narrowed which increases the turbulence of inhaling and exhaling air. With the increased rush of air, the throat tissues flap back and forth, causing the snoring sound. Snoring can cause fatigue, irritability, and a lack of focus. It can be indicative of life-threatening sleep apnea and can lead to depression, weight gain, the risk of heart disease and stroke, increased risk of diabetes, and increased blood pressure. Avoid these conditions and benefit from better sleep by reducing or relieving snoring. Consider alternative non-invasive, natural treatments before succumbing to medication, surgery, or a loud and cumbersome CPAP machine. According to a study by the Journal of The Royal Society of Medicine, a patient learned self-hypnosis and performed it daily. The success of hypnotherapy as an approach to stop snoring before attempting was confirmed and is now regularly recommended before more invasive procedures. The best approach to learning hypnotherapy is to locate a professional in your area who has experience successfully treating snoring and sleep-related problems with hypnosis. Research books, podcasts, and recordings to learn more about self-hypnosis and sleep disorders. These resources will lay out a step-by-step process for you to relieve snoring. Studies show that mouth and tongue, or oropharyngeal, exercises reduced the frequency of snoring by 36 percent when performed correctly. Derived from speech and swallowing therapies, these exercises aim to increase muscle tone to decrease snoring. Saying the word oropharyngeal is an exercise, but if done correctly, you will see a decrease in apnea symptoms like brain fog, fatigue, and irritability. The primary goal of these exercises is to strengthen the muscles of the throat, tongue, soft palate and jaw that would otherwise block your air passage. Actively toning the muscles that keep your airway open will strengthen throat muscles that collapse during sleep, and tongue exercises will help keep your tongue from falling back into your throat when you sleep. Yoga is an efficient and easy way to help prevent snoring. Yoga focuses on breathing and often helps in reducing stress. Regular yoga breathing exercises may be beneficial by strengthening the upper airway muscles. Yoga exercises also help increase lung capacity and blood circulation which also aids in keeping your air passages open. It is not unusual to lose weight when you start a yoga program. Additional weight can be one of the leading causes of snoring. Begin with the pranayama. This is a deep breathing technique that helps by strengthening the muscles of the throat and face. It also increases the amount of oxygen present in the body and relieves congestion. Move onto to the Roaring Lion Pose (Simha Garjasana). This exercise helps open your airways and strengthens the muscles of your throat and mouth allowing you to breathe in more oxygen. It improves the respiratory process by activating parts of the respiratory system like the lungs, larynx, and trachea. Finally, practice the Om Mantra. The Om sound is a form of energy made up of vibration. By repeating “Om,” you are relaxing your body and relieving chest and nasal congestion. Yoga is a great alternative to aid in reducing your snoring problems. Yoga is a natural therapy that can reduce snoring by decongesting your breathing passages and strengthening throat and facial muscles. Yoga is safe and has no side effects. Magnetic therapy has been around for centuries in Chinese and Indian alternative medicines. It is often used for pain in the back, ankles, knees, and shoulders, but it has also been effective in helping people with snoring problems. Magnetic therapy is widespread in China and other parts of the world. Magnetic therapy can help snorers by stimulating the nerves in the nose, opening the airway to the throat and cutting back on the vibration that causes snoring. Magnetic pillows aim to improve sleeping posture to avoid air obstructions and relieve back and neck pain by using the magnetic therapy procedure. Manufacturers of the magnetic pillow claim the pillow enhances blood flow and relaxes the muscles in the neck and throat. Magnetic nose clips press on the nasal septum to provide normal airflow while the built-in magnets provide magnetic therapy. It’s essentially a nose ring with two earth magnets. Acupuncture is gaining popularity in the Western world. In traditional Chinese medicine, the belief is the body’s energy flows through 12 different meridians that are linked to a different organ. Too much of any emotion can cause a disturbance in that meridian interfering with the body’s energy. Acupuncture’s goal is to speed up the natural healing process by stimulating a particular point on the body. When it comes to snoring, the sinuses are the area that must be stimulated. Sinusitis is a condition commonly linked to snoring. Sinusitis causes nasal passages to become blocked, resulting in noisy breathing or snoring. Chronic nasal congestion due to allergies aggravating the sinuses can be reversed with acupuncture. Acupuncture dilates the blood vessels and allows oxygen and nutrients in to support the tissues in the nostrils. This reduces the congestion and opens the airways, thus solving snoring. In Asian medicine, the swelling associated with allergies and sinus infections is thought to be a symptom of a Qi blockage. Qi is considered a person’s energy or life force. Acupuncture will treat the root of the snoring problem by aligning the body’s flow of energy and helping the person’s Qi. Acupuncturists concentrate on stimulating the flow of qi by inserting small, hair-like needles into acupoints on various parts of the body. According to a recent study, patients who received acupuncture had significantly fewer respiratory issues during sleep when compared to those who did not receive acupuncture. Dry air contributes to snoring problems as the dry air dries out the throat and nasal membranes, thus creating congestion as the body tries to reverse the symptoms. Congestion restricts the airway and disrupts the natural breathing process causing the tissues to vibrate. A humidifier helps by eliminating the dry air allowing you to breathe more naturally. Adding essential oils to the humidifier can help relieve congestion tremendously. If you don’t have a humidifier, you could also use the essential oils in a steam bowl. Just before bed, add five to ten drops of one or two essential oils to a bowl of steaming water. Place your head over the bowl and cover it with a towel so you can inhale the steam. Try to stay in this steam inhalation treatment for five minutes. Research has shown that certain essential oils help people who suffer from snoring. In a study, snoring people and their partners were given a quiz before and after the application of essential oils. An impressive 82% of the people using the essential oils had partners reporting a reduction in snoring. Peppermint oil relieves nasal and chest congestion. It has been used in many medicines and is excellent for sore throat relief and reducing congestion of the nasal passageways. If you suspect congestion is causing snoring, inhale natural peppermint oil through a steam bath to shrink the congested membranes of your nose and throat. Alternatively, you can gargle, but not swallow, a glass of cold water with one drop of peppermint oil to treat your throat directly. Eucalyptus has been used to help with chest colds for centuries. It helps to open air passages. Apart from help for snoring, eucalyptus is commonly used as a treatment for the common cold. It helps to clear out mucus in your nose, increasing your ability to breathe more naturally. Adding leaves or essential oil to boiling water and directing the steam toward nasal passages will clear airways and reduce or eliminate snoring. Nasal irrigation using a neti pot has been around for centuries. It originates from the Ayurvedic medical tradition. The neti pot resembles Aladdin’s lamp and is used to pour pure water or a saline solution into one nostril, so it flows out the other. The water passes by the small hairs, called cilia that line your sinus cavities. When healthy, cilia wave to push mucus through your sinuses to eliminate it. Saline solution helps the cilia effectively remove the allergens and other irritants that cause sinus problems. Never add essential oils or any other substance to a neti pot because you could burn the sinus membranes. Clearing sinus congestion of irritants can calm inflammation and enable clearer breathing, eliminating or reducing snoring. A metal ring worn on the little finger applies pressure to two or three acupressure points to stimulate a better flow of energy. For the best results, wear the ring for an hour before bed and through the night. The light pressing of the nerve can help reduce sinus swelling and congestion. Users report that 85% of people experienced a degree of snoring relief from the device. If you have a pollen allergy, drink a cup of stinging nettle tea just before bedtime to soothe inflammation caused by allergies. This common herb is available at most health food stores in the form of loose or bagged tea. Add one tablespoon of tea to a cup of boiling water, let it steep for five minutes, strain and drink. During heavy pollen seasons, drink this tea nightly to help keep your breathing passages clear and reduce inflammation due to allergies. When your airways are less congested and irritated, you’ll be able to breathe more easily at night. The American Dental Association states that oral devices worn during sleep may be an effective treatment option for eliminating snoring. An oral appliance is similar to a sports mouth guard or a retainer. The snoring mouth guard supports the jaw in a forward position helping to maintain a clear upper airway. There has been a lot of research and studies have shown that oral appliances have a definite role in aiding in the reduction of snoring and sleep apnea. The one that is best for you depends on what is causing you to snore and which one feels the most comfortable. Look for a device made of a moldable copolymer that can be heated to fit the shape of your jaw. The MAD is the most popular and widely used mouth device for snoring. It resembles a mouth guard used in sports. The device snaps over the upper and lower dental arches and has metal hinges that ease the lower jaw forward. It pushes the tongue and jaw forward making the airway larger thus improving airflow. These devices also inhibit teeth grinding, which is commonly associated with sleep disorders like snoring. The tongue retaining device is a splint that holds the tongue in place to keep it from obstructing the airway. Nothing can compare to finding the oral device that works for you. With so many products available today, take time to compare the products and their features and then select the one you think will best suit you. Snoring is a pervasive problem that affects people all over the world. Don’t ignore the symptoms and the resulting fatigue, irritability and lack of focus snoring can cause. Rule out any underlying detrimental health issues then seek out the best alternative snoring solutions for you. There are various alternative methods or snoring solutions to help alleviate snoring. Investigate non-invasive, natural treatments to treat minor snoring at home and benefit from better sleep. 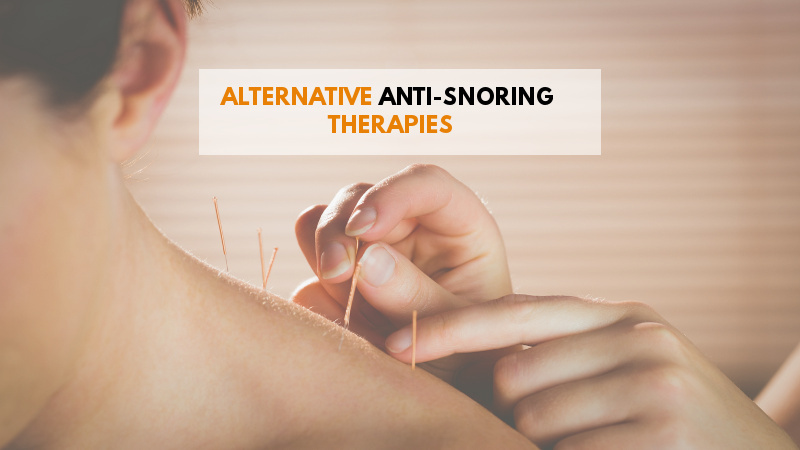 Incorporating one or more of these alternative methods can help you stop snoring, improve your overall health and get a good night’s sleep.